Thank goodness we had lovely weather in Northeast Ohio for Vienna Historical Society’s Second Annual Historic Cemetery Walk, 22-23 October 2011! Over sixty people toured the gravestones, investigating the Civil War through the experiences of Vienna residents. We discovered who went to war, who purchased substitutes and why, and how those who stayed at home aided the war effort. Visitors also inspected the gravestones and monuments restored by Ta Mara Conde of Historic Gravestones Services, New Salem, MA. 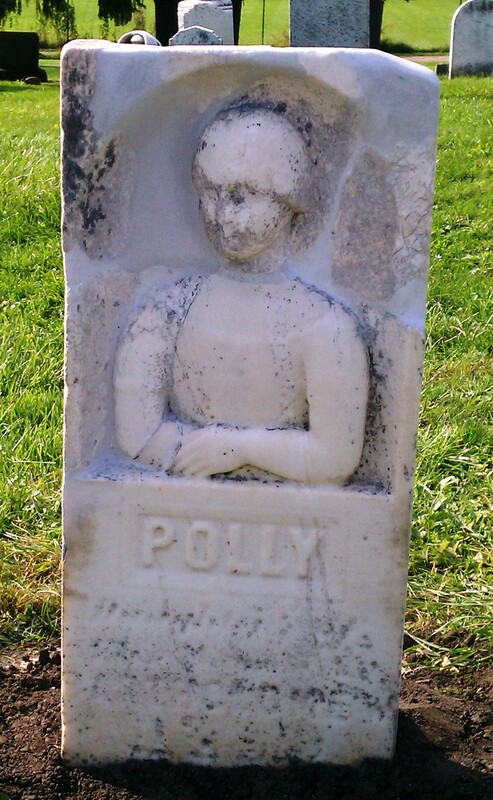 The gravemarker (pictured) of ten-year-old Polly Bartholomew, who died in an epidemic of “putrid sore throat” that plagued Vienna Township in late 1860, was one of the monuments restored and proved to be quite an object of curiosity. Writing the tour script for this cemetery walk was an exercise in genealogy and local history, of course. Yet it also revealed to me the extent of the nation’s military record-keeping. I was able to identify 95 Union soldiers with roots in Vienna Township. Draft registrations, enlistment rosters, Federal Censuses, pension schedules, old soldiers’ homes records, newspaper articles and obituaries, and grave markers provided a wealth of information. It’s a first step toward writing a small volume on Vienna and the Civil War. We also employed some lessons from last year’s Cemetery Walk. For the first time we used period maps to explain the changes in Vienna Center caused by the Civil War, and we prepared handouts so that visitors could more easily engage the historical story being told in six different stops. I’ll be posting the tour to the Vienna Historical Society website soon. In the meantime, images of the tour may be seen here.